Lucky for you, the list of newborn baby needs is not long. Look no further and then go and enjoy your baby. This post is not going to tell you to buy tons of expensive baby gear. I’m not going to say you need a baby wipe warmer because… the thing is… you don’t. So many moms spend the months leading up to delivery worrying about what to BUY instead of worrying about what to DO when you get home with the baby. All the best baby gear in the world won’t help baby be content and sleep well. Only healthy habits will. So without further ado and me telling you that THESE FIVE THINGS are really the most important (because they are) let’s go. Here we go. You might want to take notes. Actually, you don’t need to take notes because you can go here to my Ultimate Newborn Guide and print that out! So first off, your baby needs lots of cuddles, skin to skin time, and affection. It helps their brains develop, forms a bond, and gives baby a sense of safety. You don’t have to wear baby all day long to get this. Between feeds, between naps, and during feeding are all times you can and will be holding baby. In those first few weeks you may want to wear baby quite a bit during the day, but unless you plan on continuing this for a year, you may consider putting baby down for naps in their own space by around 6 weeks. For about 1,346,464 reasons, sleep needs to be a primary concern in these early weeks. If baby is overtired baby they’ll be fussy, irritable, and difficult to settle. Here is a common scenario with moms of newborns. You bring baby home from the hospital and he falls asleep all the time on his own. You hold him a lot because – duh – you love him and he’s squishy. Soon he develops a habit of sleeping in your arms. At first, this is cute. Then your husband goes back to work and you’re on your own. You realize that you basically can’t do any of the things you need to do if you want baby to sleep. You find baby to be fussy and irritable so – because he’s crying – you assume he’s hungry. Now, every time baby cries you feed him because why else would he cry? 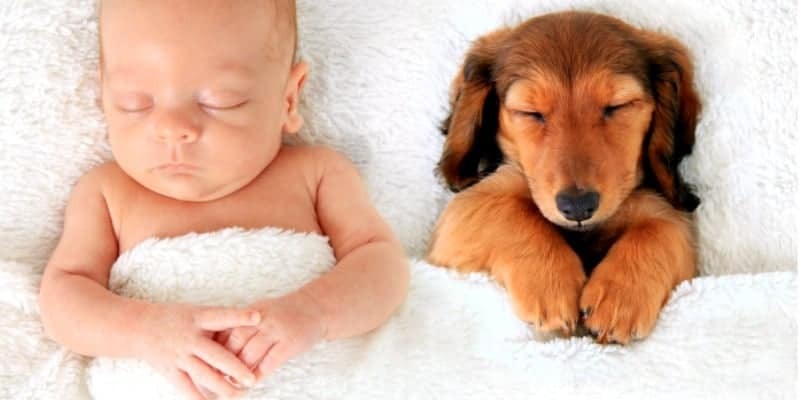 He takes short naps – while you are sitting or carrying him – and this means you can’t get anything done. Baby fights sleep constantly and you are reciting mantras about how it’s only for a season and it’ll pass and all that. Soon, baby will only sleep if you feed him to sleep and, even then, the naps aren’t great. He’s up frequently at night and you feel like you’re cluster feeding around the clock. You are freaking tired and hormonal and kinda depressed and guilty and ashamed of it all. Read: All my baby sleep posts are here and, if you need more help, I encourage you to take my free baby sleep tips series! The best way to get baby to sleep well and be happy and sweet and you rest well and be content and excited? Baby needs a routine and you need a routine that fits around the baby’s routine. You don’t have to be ruled by the clock or have such a rigid routine you are miserable. But the fact is, having a routine will result in such a pleasant baby, that you will end up liking it. That’s the truth. You’ll see a baby that sleeps well and you’ll not be a tired mom and, come hell or high water, you’ll keep that routine. 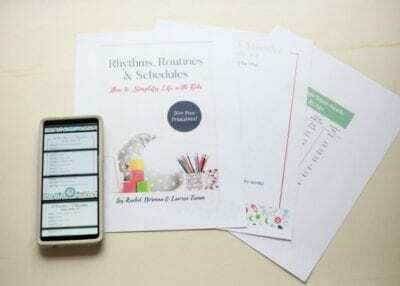 Read: 35+ printable routines for babies aged 6 weeks to 5 years! Bed time | There is a such thing as too late of a bedtime. Babies don’t sleep well if they’re overtired so choose a bedtime that allows baby to get restorative sleep before the dreamfeed. The truth is: your baby needs you to be okay. That is not to say you should feel guilty that you aren’t okay. It is to say that it’s okay to do the things that keep you okay. This is called guarding your heart and your boundaries. You have limits and you should not martyr yourself. Sleep | You will be up for nightly feedings for a while, but you shouldn’t be up cluster feeding every hour all night. If you are, baby is snacking, you’re outta milk, or baby has sleep props. Stability | One of the biggest struggles of new mothers is the upheaval that comes from a new baby. You’d not trade it for the world, but all the changes can take their toll on a mom. 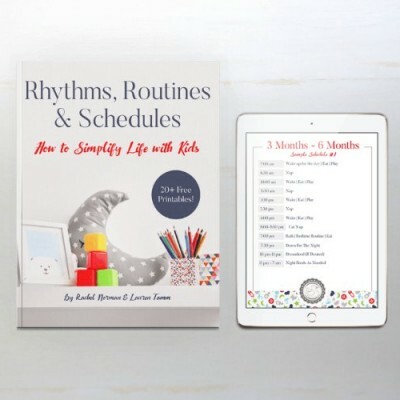 Routine (for you and baby) will help you weather the changes without losing your sanity. Support | Don’t be afraid to ask for help. Don’t feel silly saying you’re bluesy or worn out or need help. Get in touch with what you want and need and don’t martyr yourself by trying to do everything on your own if you don’t have to. If you’re in the hospital right now then please, swaddle baby from day one and don’t stop until he can roll over onto his tummy and roll back. Swaddling helps baby sleep through the startle reflex, it gives them a sense of snugness that is familiar from the womb, and it’s a great sleep association. Unless baby screams bloody murder after having been swaddled, there are literally no cons to swaddling. It’s all good!